Additional details and responses to commonly asked questions about Feedtrail’s platform are provided below. If you’re looking to learn more, our customer success team is happy to chat. How long does Feedtrail take to implement? 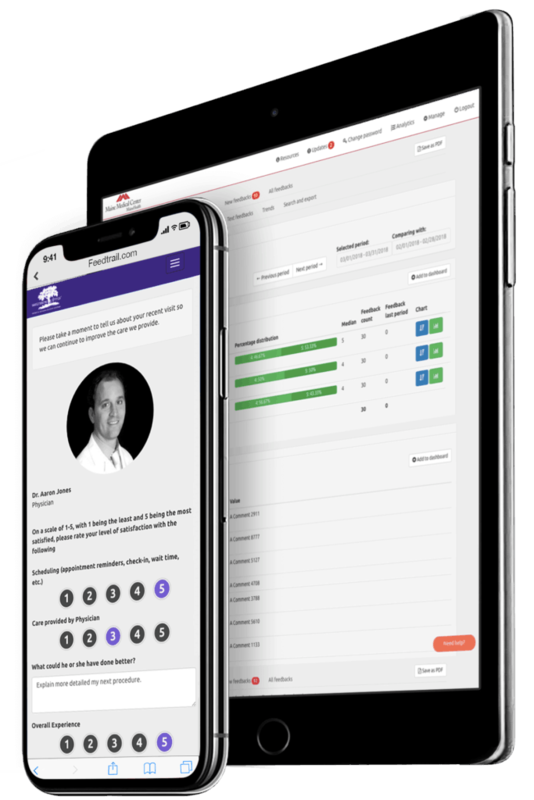 We can design, customize, and roll out the platform within one week of an organization’s commitment to launching a pilot program, as long as your team is ready, willing, and available to get started. What size and type of healthcare organizations does Feedtrail work with? We work with organizations of all specializations and sizes. Our clients include 20-bed critical access hospitals, 3,000-bed health systems, medical clinic groups with 70+ locations, physical rehabilitation clinics, concierge medicine practices, cancer institutes, and more. Feedtrail empowers providers across the spectrum with real-time patient feedback so they can keep their promises to patients and respond to hiccups on the spot. Can we customize the questions on our feedback form? Yes. Your team will have complete control over the questions you ask, provided that they don’t overlap with CMS guidelines. You will have the freedom to set up unique question sets for each department, location, and provider within your organization so you can ensure that your team is learning about what is most important to their specific domain. You can also customize the thresholds by which a follow-up question may appear or get a notification right on your mobile device. How long will it take for my organization to notice results? Our customers have seen results in less than a month. We fully believe in the power of the information gathered from your patients using Feedtrail, but the feedback is only as powerful as your commitment to responding. Ultimately the results will depend on your institution taking swift and effective action in response to the real-time information you receive. We recognize that each of our customers has unique needs, and we tailor our system to meet your specific goals. Want a quote? Contact us for a demo. How do patients provide feedback? Our platform is entirely web-based so patients can access their custom feedback form on any device with internet connection. Patients will typically access the form via a link in a text message they receive on-site while visiting your organization. In an outpatient or a clinic setting, providers may opt to have patients respond using tablets prior to discharge. Does Feedtrail require patients to download an app to provide feedback? No. Our entire platform is web-based so that any patient with an internet connection on their device can access the feedback form. The same goes for providers who want to monitor the feedback received; they can log in to their Feedtrail account to review all patient feedback from the convenience of their own cell phone, tablet, laptop, or desktop computer. Is there a limit to the number of users we can have on the Feedtrail platform? No. Any number of users within your organization can be given access to your Feedtrail platform. Will the notifications overwhelm on-duty staff? No. Notifications are highly customizable, meaning that you decide when and how notifications will be sent, and who is to receive them. In other words, you are in complete control of how notifications from the system are sent to your key personnel for either service recovery purposes or organizational improvement. Does Feedtrail integrate with other software programs? Yes. Our platform has the capability to integrate with a wide variety of other healthcare software platforms including EHRs, risk management, scheduling, and shift management software. Can we pull reports from the data we collect? Yes. All individuals with access to your Feedtrail platform will have the ability to produce custom reports at the frequency of their choosing (daily, weekly, or monthly), and data can be exported into Excel for further analysis. Does Feedtrail comply with CMS guidelines? Yes. We have several safeguards in place to ensure that all aspects of our platform, including the questions asked of patients, do not overlap with or contradict any of the CMS-mandated CAHPS questions. Is the data we collect safe and protected? Yes. We prioritize the safe-keeping of patient and institutional data from external and internal intrusions while at the same time complying with HIPAA standards. All data collected is stored in SSL-encrypted Amazon Web Services (AWS) servers with the security features that include intrusion detection, 24/7 active defense alerts, patch monitoring, log and event management, file integrity monitoring (FIM), vulnerable scanning, log depot, managed malware protection, and more. In other words, your information is highly protected. If we survey patients during their visit, will they still provide responses to our CMS-mandated post-discharge surveys (i.e. HCAHPS)? This is probably the most common question we receive from prospects. Simply put, the answer is yes. We have closely monitored the post-discharge survey response rates for our existing clientele (following implementation of Feedtrail), and none of them have seen any decrease in the completion rate of CMS-mandated surveys. In fact, the majority of our clients see an increased completion rate for their CAHPS surveys. Academic research has continually supported the positive correlation between real-time feedback and improvements in patient satisfaction. Using Feedtrail to systematically reach out to patients before discharge has resulted in a rapid, significant increase in overall patient satisfaction — a 3% increase in “nurse communication” scores in as little as two months. We are running additional studies to measure the impact of our tool on our customers’ patient satisfaction indicators and are always happy to share our findings with interested organizations.